NEW BRIGHTON — Enormous birds could soon be roosting at the Staten Island Zoo — if the zoo can raise the money to buy them. 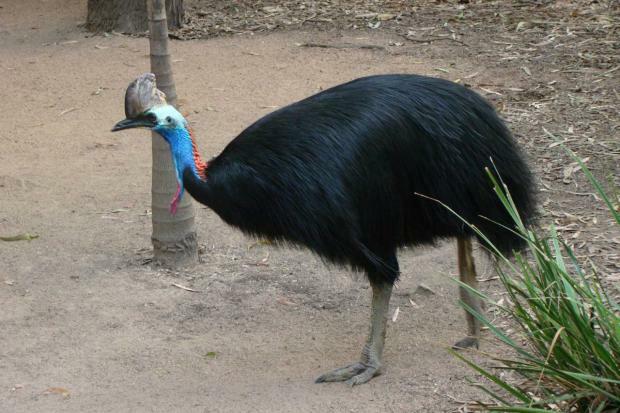 Zoo officials started an Indiegogo campaign last week to raise $20,000 to buy two cassowaries, which are the second largest bird in the world, said Mark Valitutto, curator and veterinarian for the zoo. Weighing as much as 160 pounds, only ostriches are bigger, according to experts. "They're absolutely, stunningly beautiful," Valitutto said. "It's like somebody painted them." The zoo usually reaches out to a pool of regular donors for money to buy a new animal, but this time the zoo decided to open it up to everyone with its first-ever crowdfunding campaign. "We just decided to try a smaller grassroots campaign just to get it out there," Valitutto said. "It gives the community a sense of belonging." The zoo already has other tall birds — like ostriches and emus — and Valitutto said the cassowaries, which have similarities to both, would be a great addition to the collection. The bright blue and red-faced birds, which can grow up to 6 1/2 feet tall, may look beautiful, but they are also dangerous. While generally shy, the birds attack with their large claws if anything comes into their territory, and they're known to go after hikers in their native New Guinea and Australia. "There are these huge birds that people don't even know exist," he said. "We want to be able to show that to our visitors." The flightless birds have lost much of their natural habitat and have become endangered, Valitutto said. "A lot of times they're killed because of cars," Valitutto said. "Sort of like deer in the U.S., they're kind of like roadkill over there." And because of their rarity — Valitutto estimates that only 50 to 75 live in the Western Hemisphere — they can fetch a lot of money, selling for at least $7,500 apiece from private breeders and zoos. The Staten Island Zoo hopes to purchase two cassowaries and hopes to breed them. Anyone who donates the full price of a bird to the Indiegogo campaign will get the chance to name it. Valitutto hopes to meet the fundraising goal for the birds in 60 days.